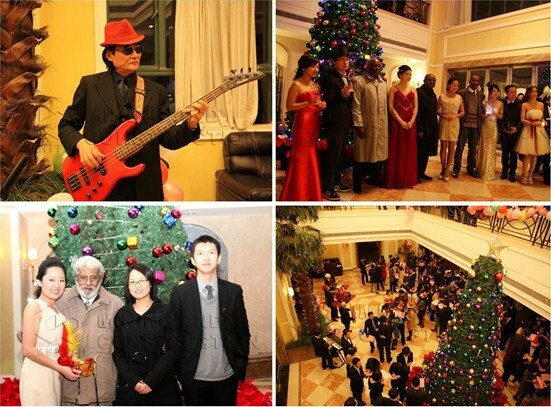 Shanghai Zenith Christmas party was held at the headquarters of Zenith, December 23, 2011. Specially invited band, sparkling Christmas tree, aging wine, delicious snacks ... ... all of the Zenith person have been surrounded by the holiday joy. That night, all of us dressed up to debut on the Christmas Party! "Men wear suits, women wear skirts, embracing and blessing before signing, collect 80 signatures to enter the lucky draw ..." and in the help of winning Ipad, everyone changed the usual stiff, have hugged, and dedicated the best blessing to each other. Accompanied by the Christmas songs of Zenith choir, Christmas Party started. Elegant waltz, cheerful Rabbit Dance, the high Plateau, the tenderness of the New Everlasting Love, ... Zenith person singing and dancing, even the visiting customers cannot help to integrate into the dancers. After singing and dancing, the exciting part of lucky lottery debut heavily! In everyone’s expectations, the prize turns announced, and one of the winners (one expectant mother in year of Dragon) is voluntarily donated prizes to her departments, to hope that lucky can continue. Mr.Abid, one of our customers from Pakistan, left dismally until the end of party. Before he left, Mr.Abid said: "It’s so honored to participate in your activities, make me have a new understanding of Zenith. You are the leading, not only the products, but also service and the team is also full of vitality. Looking forward to more cooperation! " Christmas nights, are you happy yet?